In an unusual move, 20th Century Fox has released the next Blue Sky Studios move Rio in 72 countries outside of North America, a full week before releasing it in the U.S. on April 15th. According to reports the film is already doing quite well in Russia, and a few other countries as well. Like the Ice Age films from Blue Sky, this new film is directed by Carlos Saldanha. It tells the story of a blue macaw named (appropriately) Blu. Domesticated, it seems that Blu has never learned to fly. It also seems that he is the last mail blue macaw — and so begins his journey to the title city, where folks hope he will mate with the one remaining female blue (named Jewel) to save the species. Fox has released the first two minutes of the film as a video, and (in an only-these-days bit of tie-in) there is also a video advertising the Angry Birds/Rio game app for your I-Phone. We’ve talked around here before about Reed Gunther, the weird and wacky wild west comic book independently published by brothers Shane Houghton and Chris Houghton. Now, the comic book returns, this time in full-color and published by Image. Why should furry fans care about a cowboy comic? Perhaps because wildman Reed Gunther’s noble steed is a full-grown grizzly bear named Sterling. The bear doesn’t speak — but he has his own ways of commenting on the action all around him. Which is a lot, as Reed has a habit of meeting (and often battling) all kinds of strange and deadly critters throughout the badlands. In their first adventure from Image (coming this June), Reed and Sterling face off against a giant, cow-eating snake! Ya gotta love Kaiju fans sometimes. The come up with things like: Godzilla: Gangsters & Goliaths. (“Kaiju”, if you didn’t know, is Japanese for “giant monster”.) This new five-issue full-color comic book miniseries comes to us this June from IDW. It’s written by John Layman (Chew) and illustrated by Alberto Ponticelli (Unknown Soldier). Here’s the story: Tokyo detective Makoto Sato is on a never-ending quest to bring down the Takahashi crime syndicate. Soon, his efforts win him a one-way ticket to a tropical paradise… known as Monster Island! Before long Sato is battling for his life against behemoths and bad guys… and to survive, he must enlist the aid of some “bizarre friends”. We’ll find out what that means this summer. 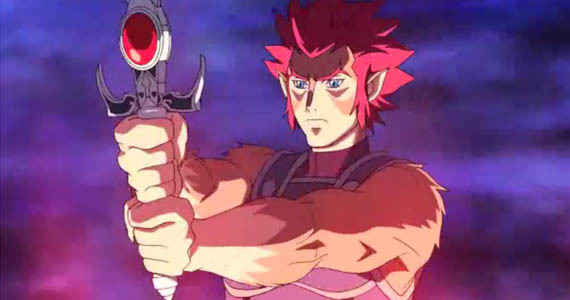 Looks like they’re getting serious about the return of Thundercats this time around… This footage was recently shown at Wondercon — to, reportedly, thunderous applause. It’s interesting to note that this new show from Cartoon Network looks much more anime in style than the old original series. It also spends a lot more time setting things up on the Thundercats’ home world. We’ll find out more when Thundercats comes to Cartoon Network this July. Yet another mega-series from another big-name comic book publisher. This time it’s DC Comics’ Flashpoint. Several of your favorite superheroes find themselves zapped (in a flash, of course!) to another universe where things have not worked out the same at all as in the “normal” DC universe. Leading the battle to get these stranded heroes home is that super speedster The Flash. Several continuing titles are taking on the Flashpoint story-line, and there are also several one-shot titles involved — some of them of note to furry fans. 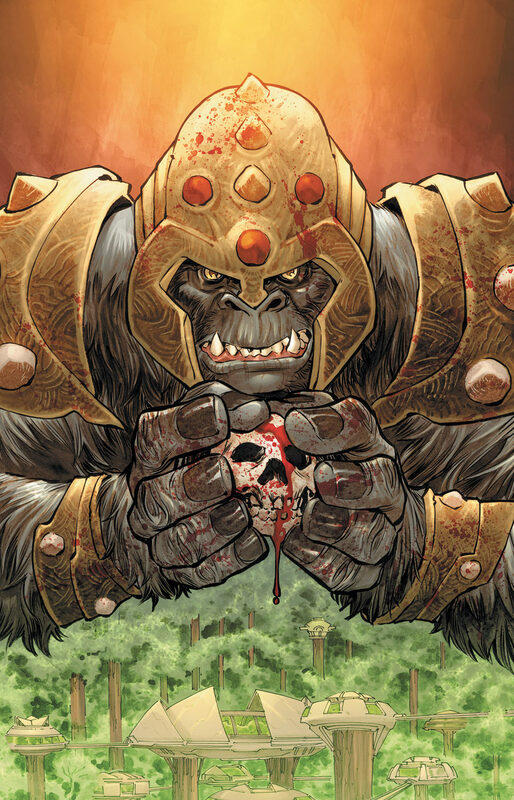 First off in Grodd of War, Gorilla Grodd seems to have made good on his ambition to take over the world… or at least a good portion of it, as he now rules Africa! Then, there’s the mysterious, very British, very insectoid adventures of The Canterbury Cricket (“His Power is his Curse!”). All of this starts going down this June — and all in full color, of course. Now this is something different: A comic book written by a 6-year-old boy, professionally published. That boy would be young Malachai Nicolle, and the comic would be Axe Cop, currently available from Dark Horse Press — illustrated, no less, by Malachai’s 30-year-0ld brother Ethan Nicolle. Axe Cop has been a hit on line since its premier in January of 2010, and now Dark Horse is releasing it as a three-issue full-color miniseries. Fur fans should note: Several interesting anthro characters make their way in and out of the story, including Axe Cop’s reptilian partner, Dinosaur Soldier.